If you’ve been searching RV Solar Panel Installation near me in Mesa, Phoenix, Chandler, Gilbert, Scottsdale, or Tempe; we can help! The RV Solar Panel Kits we sell and install are great for RV battery charging, RV air conditioners, and all other power needs. Portable RV Solar Panels give you the freedom to roam past where the power grid reaches. We only carry the Best RV Solar Kits so you can venture into the wild with confidence! Cliff’s Welding proudly sells and installs RV solar systems from Go Power! We can choose the perfect combination of panels, inverter, and other hardware to provide the power you need, where you need it. Go Power! Has been a leader in the solar power industry for over 20 years and we are proud to offer the highest quality RV solar power products to the residents of the Phoenix Valley. 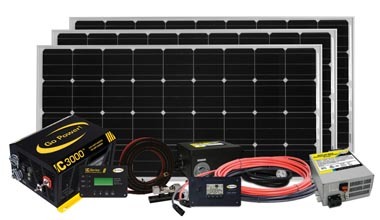 Cliff’s Welding offers professional RV Solar installation that includes the full kit. You will be able to get a kit that includes the solar panels, inverter, mounting hardware, and the charge controller. Our RV Solar installation provides a safe and reliable power platform for you to enjoy longer trips to remote areas. With a complete solar power kit for your RV you’ll be able to enjoy peace and quiet. Imagine no loud generator running the serenity of your adventures. Nor will you have to stress about draining your batteries while off the power grid. Large panels to power soak up all the available solar energy and get your batteries fuller quicker. Power inverter turn energy from your batteries into the energy your TV, radio or computer needs. Maximize battery lifespan by including a solar controller to prevent overcharging of your system. Installing transfer switch makes it possible for your inverter and shore power to feed the circuits. Keep track of the energy flow in your RV with an inverter remove that keeps track of your power. RV Solar power offers the freedom to explore further. RV owners who want to stay in more remote areas, or simply provide their own power to reduce travel costs love having a solar power system. An RV Solar system also requires little maintenance, maximizes your battery life, and provides electricity that is safe and reliable. They say not all who wander are lost, and that is true for many RV owners. When the path less traveled takes you away from the city and the power grid your RV Solar system will provide the AC and DC power you need for the electrical devices you depend on. As long as the sun keeps coming up each day free renewable energy is streaming down. Solar is by far the most clean, safe, and simple source of energy on the planet. This makes it easy and beloved by outdoor enthusiasts who want to protect mother earth and preserve our planet. The solar power system doesn’t require upkeep like a lot of the tools we rely on. There’s no oil to change, no fuel to add, and no moving parts that wear out and need replacing. The only thing RV solar panels need is the occasional cleaning to be ready to produce the power you need. When installed by professionals your RV solar system will provide the power you need yet be very safe. Most system are 12 volt and run on less than 30 amps. With that low of draw system and our professional installation there’s virtually zero chance of electrocution or fire. Whether you’re camping by other people or simply trying to enjoy nature the sound of an electric generator isn’t a welcomed noise. Your RV Solar system quietly collects the energy you need without creating a racket and ruining the serenity of the moment in the wilderness. When your system is installed correctly it will provide the energy you need and reduce the strain no your RV batter and alternator. With the lowered strain the battery will last longer and end up lowering the cost of ownership for your RV and help take the adventures further. If you’d like to enjoy the freedom of RV Solar power, Cliff’s Welding can help! Our team can help you select the right RV Solar system for your needs and professional install it.We sell Go Power Solar Power RV Solar systems so you’ll have the power to travel wherever you choose! Stop by or give Cliff’s Welding a call today at 480-832-0570 to discuss your RV power needs or schedule your RV solar power system installation. Cliff's Welding gives RV owners the power to roam with Solar Panel Installation.